To remain equally cheerful in the peak of health and comfort as well as in times of old age and sickness is surely a sign of equanimity within. ‘Sweet smiling’ is the phrase that comes to one’s mind as soon as one meets Smt. 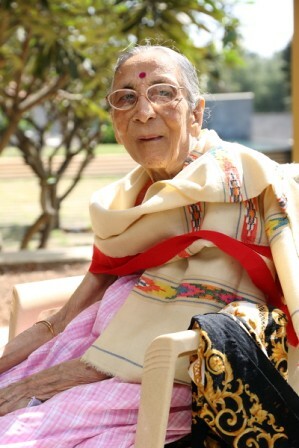 Saroj Ben Desai, an 86-year-old Gujarati great-grandmother from Bangalore. A mother of 3, grandmother of 4 and great-grandmother of one (with the second one on the way), she was bright and alert when I met her in the morning. Her speech was impaired but I was able to understand most of it as she spoke in Gujarati-mixed Hindi. Showing their PERFECT rapport with each other, her daughter-in-law, Veena, happily filled in the gaps and was an affectionate and gracious presence during the interview. Namaste Saroj Ben. Tell me about your beginnings. I was born in Gujarat in Chaani village near Baroda. I grew up with my Foi (Father’s sister) in Barauch since I lost my mother when I was seven. That is a deep loss at such a young age. Foi was very affectionate to me and did not let me miss my mother. I kept busy with school and housework, as well as enjoyed doing embroidery whenever I had the time. Veena (daughter-in-law): She used to make beautiful patterns in embroidery even till her sixties. All of us have worn clothes with her embroidery motifs. She used to gift her delicate handiwork to many near and dear ones. Your home is exquisite and breath-taking. Veena, have you learnt your housekeeping skills from your mother-in-law? Veena: This house has been my husband, Bimal’s, dream. He bought the land almost ten years ago but we moved in just a year ago. To answer your question, I have learnt a lot from Ma, including how to manage in all types of situations. But what I have enjoyed most is jotting down her recipes. She makes awesome authentic Gujarati food. So tell me Saroj Ben, whom did you learn cooking from? I learnt from watching my elders cook. But most of all, I learnt to enjoy cooking because of travelling. My husband and myself travelled extensively across the globe on holidays carrying homemade food with us wherever we went. I was married when I was 22. Was that considered the right age for marriage back then or did you have a late marriage? Oh no, that’s how it was and is. You get married whenever you find a good boy. My husband, Natubhai Desai, was the son of my father’s friend. He met me during one of my trips to Mumbai and suggested the alliance to my father. Yes, it was a good match and they had a prosperous family business. My parents were delighted with the proposal. In Gujarat and later in Pune. But for more than five decades now, we have settled here in Bangalore. This is home now. In those days how did you manage your food while travelling? That was a challenge since I was a pure vegetarian. Veena: She used to enjoy travelling and hence learnt to manage without making too much of a fuss. She took along foods such as theplas and parathas which lasted well for weeks. She also ate a lot of fruits. But she would often mention to me that many of her friends could not manage their food so easily. Saroj Ben, apart from travelling, what else did you enjoy? I enjoyed participating in Garbha dance. During Navrathri, I used to dance as though there is nothing else to do. I would forget everything else. I think I used to dance even until my sixties. Veena, what would you like to say about her as a mother-in-law? Veena: She is unconditionally affectionate and broad-minded. I am from a Christian family and had a love marriage and she simply took that in her stride. In fact, she taught me Gujarati and learnt to speak in English from me. I also learnt Gujarati cooking from her. She is an amazing person to live with. I also admire her for the healthy life she led until she was sixty. For the past twenty years, she has been suffering from Parkinson’s disease and is not so alert in the afternoons, but nothing diminishes her goodness. What is your most cherished memory of her? Veena: The way she could whip up a sudden meal for 25 to 50 people without batting an eyelid. That’s how she won her husband’s heart because he was extremely hospitable. There were always sudden guests. Saroj Ben, what did you cook? Any specialties? It would be a simple and sumptuous meal of sabzi – dal – chawal. Some homemade sweet dish such as Shrikhand and some farsaan completed the menu. Homemade pickles and papads were always part of the meal. How did the children manage when the parents were travelling? I taught my daughters to cook when they were quite young. They managed quite easily. I also believe that that is the best way to teach your children. Were you a strict mother? Veena: Oh no, she is very understanding as a mother and mother-in-law. She never imposed any rules on us such as how to dress or behave. Her children, including myself, could wear whatever we liked. She imparted the right values and then left them to find their own way. ‘Perfect rapport’ is how I would describe the understanding between the two of you. It is a pleasure to watch how she trusts that you understand her well and will represent her correctly in this interview. Veena: I know what a lucky daughter-in-law I am. I enjoy being with her and basking in the warmth of her nature. I don’t miss my husband as much when he travels, but I cannot live without her for even a day. She is more than a mother to me. Thank you so much for this interview. Excited to move on to the recipe you are going to share with me today. This post was first featured in Harmony – Celebrate Age Magazine in the column The Great Granny Diaries. An engaging series about love, nurturing and culinary bonding across generations by Pratibha Jain. Click to view the authentic Gujarati recipe Makai ni Khichdi shared by Smt. Saroj Ben Desai.